Do You have Garbage Chute Odour Issues? Contact our team on 1300-ODOURS (1300 636 877). Many people are unaware that there are two sources of odours which create those unwanted smells in your garbage chute. These different odour sources require different methods for effective deodorisation. We recommend that a ‘best practice’ in controlling odours and germs in your garbage chute should include both garbage chute cleaning and installation of permanent odour control equipment (such as the Garbage Doctor®, which operates 24 hours a day). Cleaning your garbage chute is an important part of your waste management plan. We are familiar with many of the garbage chute cleaning contractors throughout Australia, and would be happy to point you in the right direction for your chute cleaning quotations by calling our team on 1300-ODOURS (1300 636 877). The Garbage Doctor® equipment is installed to provide continuous 24/7 deodorisation of the chute and bin room. 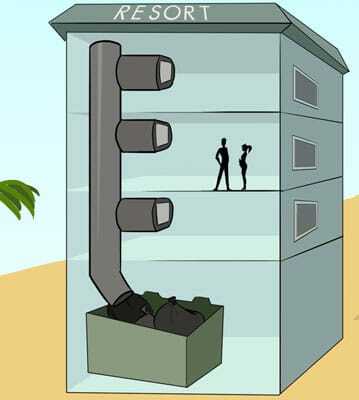 Air within the garbage chute typically originates in the bin room and then travels up through the chute to escape into the atmosphere at the top of the chute/building (this is due to ‘hot air rising’, similar to a chimney, and the exhaust fan which is installed at the top of most trash chutes). As air travels up the chute, it carries odours originating from the bin room and these odours will typically increase in strength when the inside of the chute is dirty, requiring the chute to be cleaned. Odour Source 2: Bin Odours Travel up the Chute! 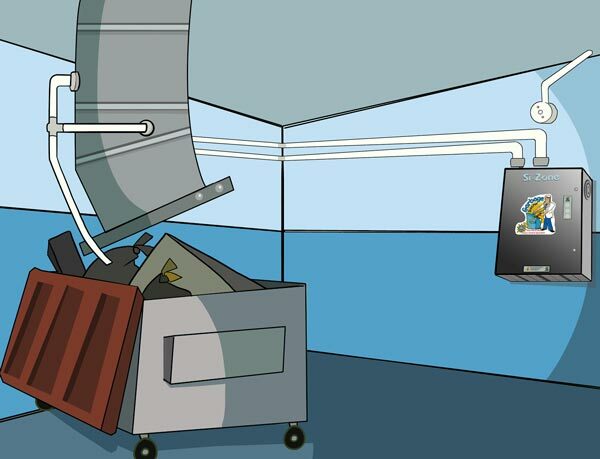 The smell from rubbish at the base of your garbage chute (originating from bins stored in the room) will get sucked up the chute. Even the cleanest chute will not prevent these odours – as the smell is not originating inside the chute itself. These odours are addressed by using an odour eliminator that runs 24 hours a day, such as the Garbage Doctor®, to assist in controlling odours and pathogens from the bins/bin room, before they have a chance to spread via the chute into the building. How often should you clean your garbage chute? Generally speaking, the taller the building the more frequently it will require cleaning – as the lower portion of your garbage chute will get dirty quicker (as all rubbish passes through these levels on its way to the bins or compactor). If you have a relatively low-use chute, then most professionals would suggest 2 cleans per year is adequate. On the other end of the spectrum, large buildings with many apartments may require 4 cleans per year or possibly even more. We are aware of some buildings with very high-use chutes which require cleaning about 6 weekly in the summer months. The engineering of the building can also play a factor, if the garbage chute opens directly into a hallway with little or no ventilation, you may find a higher frequency of chute cleaning to be necessary or beneficial. For more information on garbage chute cleaning in your apartment complex or high rise and controlling odours in your refuse system, please contact us on 1300 636-877.